Tired of watching his ball drift into the trees or splash down in an adjacent water hazard, Bill Curry decided it was time to straighten out his golf game. 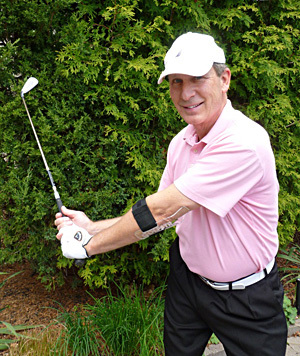 A part- time inventor, the Windsor native came up with a golf training aid that straps onto a golfer’s lead arm and forces the arm to stay straight in the back swing. “I’ve been working on my golf game for 50 years,” said the 63-year-old, who now lives in the Toronto area. “I had to get a little gizmo to make it happen.” Curry could see clearly on a video golf lesson how his takeaway is fine but his elbow starts breaking down in the back swing. “Then, I slice the ball,” he said. “I’ve been working on this for almost a year. I had five different styles of product until I finally came out with a version that made sense.” Curry tested it out on courses in Florida and California over the winter and now he’s ready to market GOLFSTR, which is described as “training wheels” on his promotional website www.golfstr.com. His club, the Oakville Golf Club, stocks the aid as well as nearby driving ranges. He’s also selling it over the Internet for $24.95. “It reminds you to keep your arm straight,” Curry said. “You use it to understand what a proper swing is.” The advantages, said Curry, are more consistent shots, greater distance and lower scores. Curry will often bring the arm piece to the driving range and ask another golfer to try it out. He’s hoping to build a catalogue of testimonial videos that he’ll launch on YouTube. A logistics consultant for a Waterloo-based company, Curry graduated in chemical engineering from the University of Windsor in 1971. His family has a rich history in Windsor, including his great grandfather, William George Curry, who along with a brother and several others owned the Walkerville Waggon Company which sold a patent to Henry Ford for use in building the Windsor-produced Model T automobile. The family owned a number of businesses, including the Curry McLeod Bank, Curry Bricks, Curry Charcoal Company and the Sandwich-Chatham Stage Coach Line that ran from Windsor to Chatham. Curry Avenue is named after his Great Great Grandfather who settled in Windsor, Ontario in 1838. If GOLFSTR takes off, Bill Curry will add another interesting chapter to the family’s business legacy.